It’ll come as a surprise to no one, that I am obsessed with sparkly things. My inner magpie has no limits. My family are well aware of this obsession and have definitely pandered to it. At Christmas (is it still ok to mention the C word this far into January?) I became the proud owner of three pairs of glitter-covered shoes. Three. While this may seem too extreme to some, I am in my sparkly element. Let me walk you through my new collection. A practical shoe needn’t look dull. In fact, I like mine bold and brash with leopard-print toes, gold glitter sides and soft ribbons for laces. I like them even better when they’re paired with gold glitter socks. What can I say, I’m an all-or-nothing kinda gal. I think it was last October I kept harping on about these Lucca sneakers and why they had to be mine but I couldn’t justify spending that money on myself. Well now, thanks to Al, I can rock them all the time. Maybe I’ll team them with my leopard-print coat, and scarf, and jumper, and skirt. Too much?! Now, while I am aware that these aren’t technically my first pair of glitter boots, I already have these bad boys, they are equally as welcome in my wardrobe. I spotted these on ASOS and knew I had to have me some Dorothy shoes. Every time I put these on, I have a habit of clicking my ankles together and dreaming of Kansas. Now while I’m fully aware I’m not actually Dorothy, it doesn’t hurt to dream. These boots seem to look the best with an all black outfit, I like the element of surprise. Like ‘pow’ red glitter boots in your face. I don’t even know where to start with these beauties. They kind of leave me speechless. While this picture may not do them complete justice, they are both silver and gold depending on what light you view them in, I think we can all agree that they are pretty special. I love a good slipper shoe and I also love a tassel so when those two worlds collide in one shoe, I’m a very happy lady. Just look how at home they are with matching garish glitter socks. Honestly, it’s a match made in shoe heaven and my feet have never been happier. 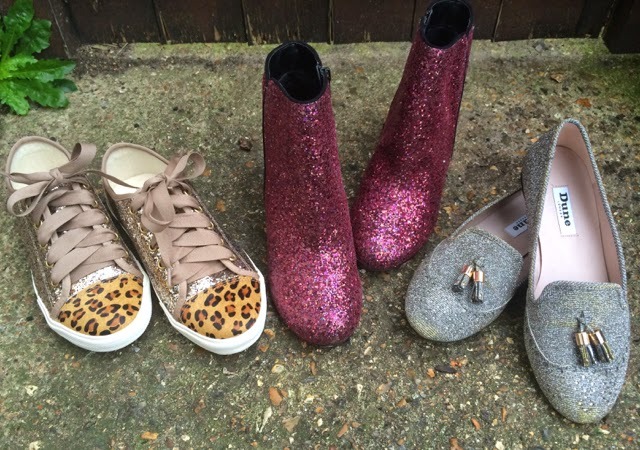 Got some glitter shoes in your life? Hook me up, I need to see. "When Red Lipstick Meets the Moon and Stars"
"Geeking Out at the Harry Potter Studio Tour"